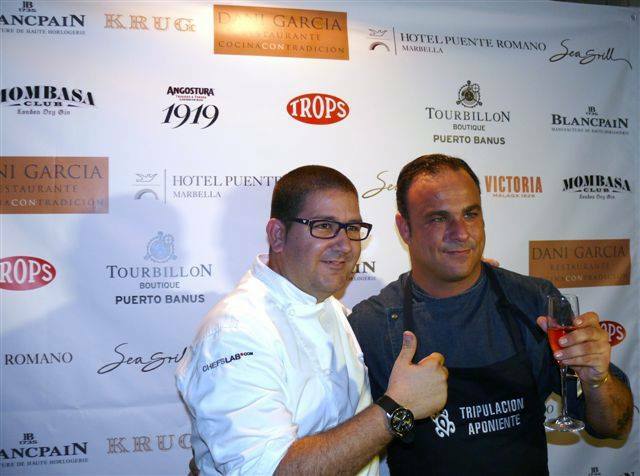 Hotel Puente Romano welcomed the first Gastronomic event with Dani García. Marbella chef Dani García united a total of 14 Michelin stars that cooked together between the 2nd and 6th February in the beautiful Sea Grill restaurant in Puente Romano Hotel. Dani García, who himself has two Michelin stars, was cooking alongside some of Spain’s top chefs. First day it was Andoni Luis Aduritz from the Mugaritz restaurant in Rentería (two stars), followed by Joan Roca, from Celler de Can Roca (three stars and considered the best restaurant in the world by the Restaurant Magazine). On Tuesday 4th, Quique Dacosta, from the restaurant of the same name in Denia (three stars), was cooking with García, followed by Ángel León, from Aponiente, in the Puerto de Santa María (one star) on Wednesday. On the last day, Thursday 6th, the other Michelin starred chefs of the province of Malaga: José Carlos García (JCG Restaurante - one star), Diego del Río (El Lago - one star) and Jaume Puigdengolas (Skina - one star) shared the kitchen with Dani and Thomas Stork, the Puente Romano’s own chef.